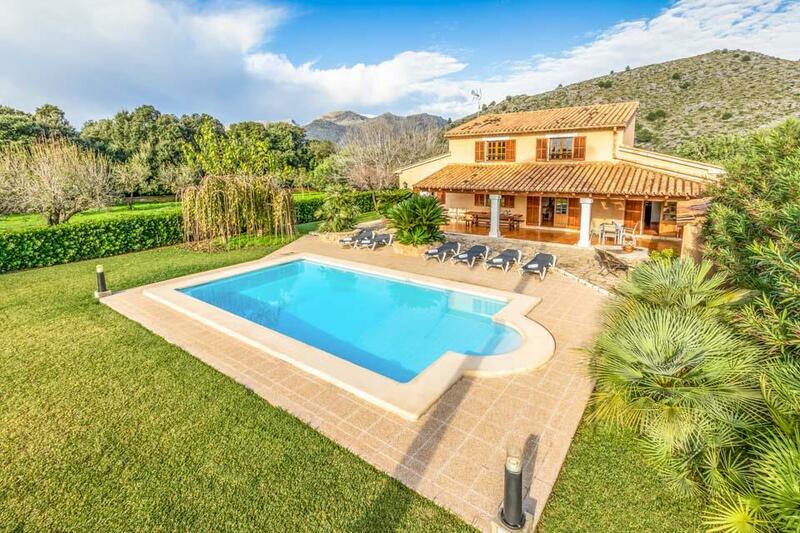 A delightful villa located in open countryside, close to the old town of Pollensa. Set on an extensive plot with pretty rural views in all directions, guests staying at Can Cama Rotja often feel that they have found their own corner of Mallorcan countryside to enjoy. Despite being such a quiet and private haven, there are a number of restaurants and a supermarket within walking distance and the beach resorts of Puerto Pollensa and Cala San Vincente, along with the old town of Pollensa, are just a short drive away. The villa was refurbished and extended a few years ago seeing the addition of an extra bedroom and bathroom. Throughout the process, the owners have taken great care to retain the traditional Finca feel with beamed ceilings and white walls whilst injecting a contemporary element with modern kitchen and bathrooms. Despite the lovely interior, guests staying at this villa tend to spend most of their time outside, enjoying the private pool, decked terrace and superb barbecue area, all with the perfect rural backdrop. We’ve been to the Port de Pollença area many times and knew the location when booking. The villa is 600m off a main road down a narrow track that definitely needs your hire car to have decent suspension! Two supermarkets and restaurants are within easy walking distance but the villa is quiet and secluded. The towns of Pollença and Port de Pollença are short drives away with many facilities. The market in the old town on a Sunday is particularly worth a visit. The villa itself is a decent size but not big and suited us with our 3 children perfectly. The pool was lovely and the filtering system was excellent so no bugs to remove as we’ve found with other pools! The local Scottish Solmar rep was very helpful when we contacted him on 2 separate occasions, and the friendly English-speaking owner popped by mid way through our 2 week stay to check everything was ok. The only thing to fault our stay was the weather which was unusually wet and cool for May, but there was still enough to keep us occupied on this beautiful island. Very cosy finca, lots of space inside - e.g. the dining room - and outside area. Nice garden, great pool, very close to Pollenca and our favorite beach Cala San Vicenc and near to the big supermarket. Even for our short one week stay we got new towels. The villa was clean and comfortable and contained lots of thoughtful touches to make our stay more comfortable. The very best thing for us was the position of this villa. While it is convenient for shopping and Pollensa old town for restaurants, it is tucked away in a quiet area surrounded by fields. Great position, if you like seclusion, which we do. Good sized pool. Good layout. Close to Pollensa. Car definitely required. Great secluded location. Very pretty area. Well equipped kitchen. Superb cycling location. The villa has everything you need for a peaceful holiday, away from the busy areas of Pollensa and the port but close enough to go to be only a few minutes drive. Lovely villa with modern feel; well equipped - felt like a home rather than a holiday villa. Very quiet location but close enough to Pollenca port and old town. Would definitely recommend it . Lovely outside space, quiet rural position and great views of the hills and countryside. This is a pretty, spacious and well equipped villa with plenty of peace and privacy. We had a lovely stay there with the birdlife and neighbouring goats as company. We met the owner a few times who was very friendly and helpful and popped by to tend the garden occasionally, but didn't impose on our privacy. Minor considerations: A few uneven boards on the poolside which might be tricky with younger children running around. Also - the villa is accessed by a longish, single track road off the main road from Pollenca to Port De Pollenca. It's a stony track so probably not suitable for low or very large cars. If you ring a local taxi - they speak good English but may ask you to walk down the track and meet them at the Restaurant L'Aup on the main road for pick up - however they did drop us right at the villa later at night. This is a pretty, spacious and well equipped villa with plenty of peace and privacy. We had a lovely stay there with the birdlife and neighbouring goats as company. We met the owner a few times who was very friendly and helpful and popped by to tend the garden occasionally, but didn't impose on our privacy. Delicately beautiful villa, fully equipped in a quiet area. We loved the rural secluded location of the villa which meant that we could truly relax. The views from the pool and garden area were beautiful. The villa was well equipped and clean. Trivelig rolig område. Greit å leie bil når man bor såpass utenfor allfarvei. Vi leide en VW Caravelle og man bør ikke ha noe større bil da veien inn til boligen er veldig smal. Vi hadde et deilig opphold med mye bading selv om været ikke helt var med oss denne uken. Geiter, kuer, griser og høner i nabolaget. Trivelig. Boligen var kjempefin og sto til forventningene. Eierne var veldig hyggelige og imøtekommende. Leier gjerne her igjen. Good location, Good outdoor space, Lovely setting. Lovely area very peaceful excellent pool. Rated: Good. Lovely area very peaceful excellent pool. We loved the location of this villa as it was in quite a big plot and in a rural location away from the busy areas. The private, peaceful location with its own pool gave us the chance to completely relax. Rated: Good. We loved the location of this villa as it was in quite a big plot and in a rural location away from the busy areas. The private, peaceful location with its own pool gave us the chance to completely relax. Rated: Excellent. We loved the villa and Puerta Pollensa. Villa was up a very small track and hard to find at night. Situated in tranquil countryside yet very close to the beach and shops. Loved the house and pool, very spacious and well equipped. Would return tomorrow if we could. Excellent - Love puerta pollensa. Villa close to here but up a very narrow path. Difficult to find in the dark. If you go as far as you can you will see Villa Can Rotja behind big gates....it is not this one, but they have the same name. Our villa wasn't named but we found it after a while. The villa was lovely. Pool and house great. 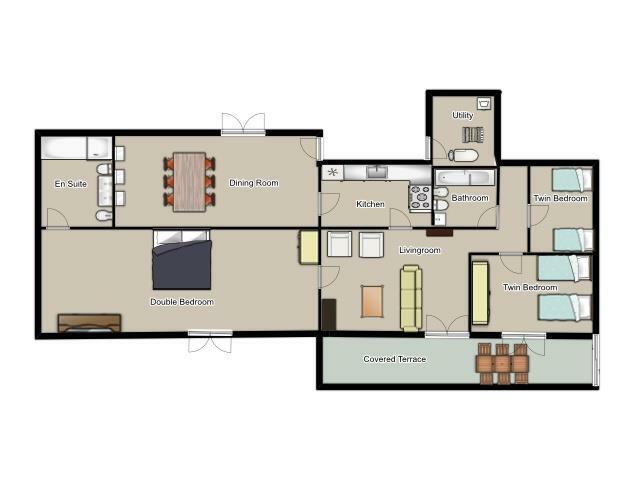 Lots of space to dine and relax. Very well equipped. Situated in beautiful countryside, looking over olive groves. Very close to Lidl supermarket which is handy. Would go again despite narrow path! Lovely holiday, lovely villa. Rated Excellent We love coming on holiday's to pollenca and the surrounding area.Something for everyone. The villa was in a fabulous, peacefull location. and we would stay here again. Lovely villa and garden, beautiful quiet surroundings, the house was very clean, good beds. We spent a lovely time there and would recommend the villa for a quiet holiday not far from the mountains and the beaches. Rated Good. Excellent villa with a beautiful pool that was perfect for my husband and teenage daughters. The villa was good thank you. We would definitely consider using Solmar in the future.We would always recommend going into Porta Pollensa for places to eat as there are so many choices and the town square is such a safe environment to eat despite all the restoration work. We loved the villa. Kids were surprised by the treehouse and tree swing in other half of garden. Also liked the fact it was surrounded by animals; pigs, goats, sheep with bells, horses etc. Multiple fig trees in garden provided fresh breakfast! The setting was magnificent down a solitary bumpy track into the heart of the countryside. Peaceful and idyllic. As we arrived and opened the gates we were met by a field of sheep, a welcoming shaded porch and pation and a pool. What more could we want. Birds soared overhead as we barbecued and we watched fledgling sparrows fed in a tree trunk nest. We had a fantastic holiday, the location of the villa was beautiful, secluded with fantastic views. The villa itself was spacious, clean and the children were so happy just playing in the gardens and pool. If we came to Majorca again we would definitely stay in the same place. All in all, first class service.